Kegel is very widespread in Europe and has been around much longer as Tenpin. We have adopted the German name for the game as Germany is the hot-spot and Kegel is played in virtually every small town. 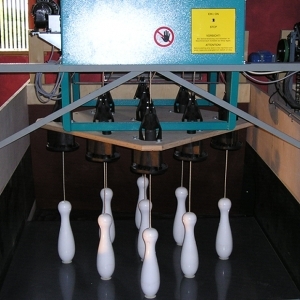 It is played like all bowling games by rolling a ball down a lane or alley with the aim to knock over as many pins as possible. The 9 pins are set in in a diamond shape with the slightly heavier and taller king-pin in the middle. The ball used has a diameter of 16cm with a smaller ball of 14cm available for children. There are two types of balls, with the most common having two finger holes for your thumb and middle finger and the other being solid without any holes. The lane is 19.5 metres long with a width of 1.3 metres and there is a gutter on each side. The lane surface is made from laminated segment boards and mounted on a substructure of bearers and joists. The pins are picked up and re-spotted by the fully automatic pinsetter. The machinery has the ability to reset all the pins after every shot or only the not knocked down pins for a further shot. It can also select a certain pin formation. The ball has to be delivered on to a narrow 35cm wide strip in the middle of the bowlers area and has to be passed under a rope. This is one of the major differences to Tenpin bowling were the ball can be thrown onto the lane. Another huge advantage over Tenpin bowling is the large variety of games that can be played. The fully interactive computer system allows the players to choose from many games, starting from simple children games and just plain fun games right through to highly competitive games that will challenge any experienced player. The sport of Kegel 9-pin bowling offers the business proprietor many benefits. Some of these benefits are general benefits and others reflect the advantages of Kegel bowling when compared to Tenpin bowling.